I am a member of the Collective Bias Social Fabric Community. I was compensated for shopping and creating this recipe as part of a social shopper insights study for Collective Bias and their client. All opinions are 100% my own. #cbias #SocialFabric #kraftrecipemakers You may see my shopping trip in picture form with all of my thoughts right here in my G+ album. This post contains my recipe for a delectable Quick Turkey Bruschetta Pie, a perfect family meal. If you share my post or photo please make sure it links back to my blog -- thanks! If you wish to print my recipe to cook tonight then please go to my Google Drive page HERE. You will be able to print it out within your browser. Our summer vacation is over and the kids head back to school tomorrow. I've been living the relaxed and slightly lazy summer days somewhat flying by the seat of my pants. During the summer a lot of the structure and schedules go right out the window. I feel like my family deserves some down time to just have fun and relax. The summer goes by so fast here in Michigan. Once the kids are into the full swing of school and all the extra curricular activities that come with it I am going to be one busy mom. I have to have easy dinners that don't take up a lot of time but I want them to still be healthy and tasty. Over the summer my laid back approach meant that our dinners did become a bit repetitive. I found out about Kraft Recipe Makers and thought that they sounded like something that could jazz up our boring dinners. Sometimes cooking for a family can become a little mundane if you can catch my drift. I do put a lot of love into my cooking but let's be honest, sometimes we need a little pick-me-up or help. I don't want my family to get bored with the same ol' stuff every night. I thought of a fun recipe that my whole family enjoys, tossed a box of Recipe Makers from Walmart's pasta sauce isle into that scenario and came up with this quick and easy recipe. The boxed kit cuts down prep time. If you need a fast meal but have no clue what to make then I heartily suggest trying this meal kit. The whole family was swooning over it! 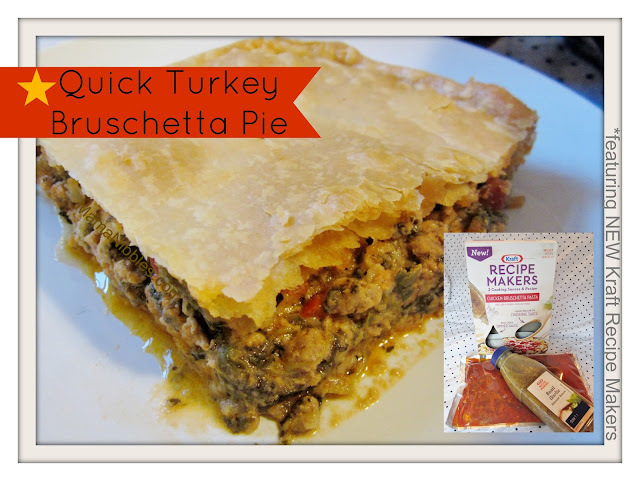 My recipe is called Turkey Bruschetta Pie and the recipe is following the next picture. I used the Kraft Recipe Makers 2 cooking sauces kit in the box labeled Chicken Bruschetta Pasta. I love quick and easy family meals. The Kraft website has plenty more recipe ideas if you are in a bind and have no clue what to cook tonight. Step 1: Preheat the oven on to 375 F. Take your Kraft Recipe Makers sauces out of the box. You will probably need some kitchen scissors to snip open the chunky bruschetta finishing sauce open. Shake up your Basil Garlic Simmer Sauce. Set out one pie crust on the table to sort of warm up. Step 2: Dice up half of your rinsed red pepper into a medium dice, be sure to get rid of any seeds. Step 3: Dump the cooked spinach into a mesh strainer. I used a wide flat spoon to smash out some of the water from it over my sink. Step 4: Put a wide saute pan over the burner at medium heat. I added a spot of olive oil just to keep things from sticking. Add the ground turkey in once the pan is hot. *TIP: a heat resistant potato masher works great to break up the meat as it cooks. This produces a perfect cooked ground meat. Cook your turkey about halfway then slide it to one side and add in the red pepper plus a dash of salt. Cook until the red pepper is slightly softened. Step 5: Once the turkey is cooked through and the peppers are soft add in the spinach and Kraft Recipe Makers Basil Garlic Simmer Sauce. The bottle is so easy to open and if you don't want to use the whole thing you can just reseal the rest for later. Simmer everything on medium for 5-6 minutes, stir every minute. Step 6: You can leave everything in the pan or pour into a big bowl. I poured my meat mixture into a big bowl to make it easier to stir and help it cool down. You will want the meat mixture to cool for about 5 minutes because we don't want our cheese to melt. Step 7: Cut open the Chunky Bruschetta Finishing Sauce from your Kraft Recipe Makers box. Squeeze the contents into the meat mixture and stir until it is thoroughly combined. I sniffed and sniffed this stuff, it smells so delicious and fresh! This sauce has chunks of tomato right in it. Step 8: Pour in the entire 2 cups of Kraft Italian Five Cheese shredded cheese and lightly stir. Step 9: Now spray your pan with a bit of nonstick spray and pour the meat mixture into it. I spread mine out evenly with my spoon. Step 10: Unroll your raw pie crust on the table. You can lightly dust it with flour if you think it will stick. I did mine on a clean table cloth and it doesn't stick to that. Roll the crust until you have it at the right size to cover your meat mixture. Give the dough a light brush with your hand from center to edges to push out the air. I trimmed the edges with a knife then rolled it over my dish. Poke about 8 or 9 holes into the crust before it goes into the oven. Bake for 25-30 minutes or until golden and bubbly. *A tip to get the pie crust on easier I roll it lightly around my french pin and then unroll it over my dish. Let your pie cool for about 5 minutes before cutting and serving. This pie can serve about 6 to 8 people. I served mine with a saute of yellow summer squash and zucchini that I evenly sliced. Just a bit of salt and pepper to those and they make the perfect side dish.